Fascination with disasters seems to be widespread as evidenced by the rapidity with which Hollywood picks up on so many, in many cases finding them extremely lucrative with a few hitting the top levels of popularity and income. One book listed more than a hundred successful disaster movies. Disasters engineered by terrorists have recently hit the screen. 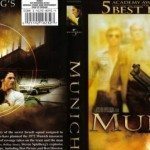 Munich is one, based on the murder of Israeli athletes at the 1972 Olympics in Munich, and now come two from the disasters of 2001, The World Trade Center and Flight 93. Even China has decided to get into movies of this kind by reliving the horrors of Nanking in the 1930s. The problem with this kind of movie is that accuracy of detail is a victim. Hollywood takes liberties with historical events, shaping them to fit the goals of the producer. For a book of this kind it is a particular problem. Many of the events documented in these two books have been the subjects of disaster movies and many people have seen them. It is important that readers recognize this disparity between the facts of the event and the additions and subtractions included by the film producer.